Take an instructional tour of traditional fiddling, region by region! Bruce Molsky, one of today's most popular performers of Southern old time music, teaches six fiddle tumes from this powerful musical tradition, each from a different geographical area and in a different tuning. For inspiration, Bruce draws on historic recordings by pioneering artists such as Tommy Jarrell, Fiddlin' John Carson, Eck Robertson, Uncle Bunch Stevens, and Carter Brothers and Son. 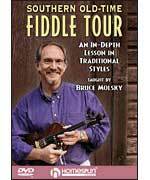 "Not only can Bruce Molsky play the devil out of a fiddle (not to mention a banjo and a guitar), and sing at the same time, he can teach you how to do it, too. On his first video for Homespun Tapes, Molsky guides the intermediate fiddler through six tunes from various parts of the South in one of the best structured instructional videos I've ever seen. The production and filming is excellent, with full body and close-up shots set up so the viewer has a clear view of both hands at all times....The lesson is an excellent way for intermediate students to master specific tunes that open out into a wealth of regional fiddle styles from the South." - Dirty Linen Download now from PlayBetterBluegrass.com!